Joe R Lansdale, need I say more? The long awaited novella is finally here, starting Tuesday Nov. 18 you will be able to get you hands on one well written and beautifully illustrated book. Santiago Caruso has created a stunning set of illustrations to accompany Prisoner 489, below you will find a preview of what to expect. Bernard lives on a small island along with two other men, Toggle and Wilson. The three of them prisoners of sort, one step from freedom. Overshadowing their little island is a larger island, an ugly, dismal island, home to an imposing prison that houses the worse of the worse. When a prisoner dies he is ferried over to the smaller island for burial. Plots are marked by number, no names needed. 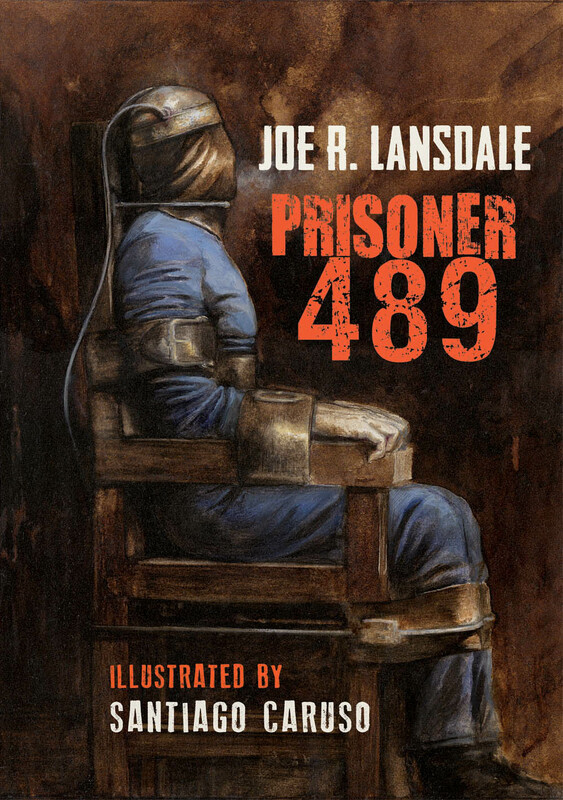 The time comes when Prisoner 489 is slated for execution. 489 is one that exudes evil. It takes four attempts to electrocute him, before ferrying him over to the small island. Taking no chances with one that was so hard to execute, 489 is placed in a steel coffin, wrapped in chains. A storm is brewing and there is an uneasy feeling in the air. Bernard, worried about Toggle goes in search of him. What he finds is beyond belief, an evil so horrific has been unleashed and the battlelines are drawn. I don’t know about you, but when I read a book by Joe, I feel like he’s there before me telling the story. He has a magical way with words, that allows for an uninterrupted flow. This was so worth the wait! Pick up your copy here. I HATE the fact that I’ve got a couple books in line ahead of this. ACHING to read it!